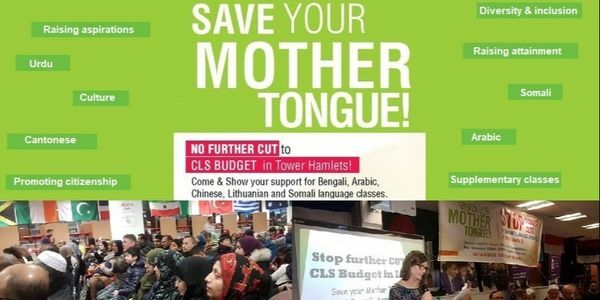 Stop the cuts to the Tower Hamlets Community Language Service! We petition Tower Hamlets Council to amend the budget and not to reduce funding to the Community Languages Service (CLS) in the financial year 2019/2020 and call on the Mayor and Tower Hamlets Council to embark on a full consultation, with financial modelling and risk to see how we can preserve this much valued and historic service, that has contributed so much to community cohesion. • The service currently caters for almost 2,000 learners across the borough representing languages including Bengali, Cantonese, Somali, Arabic, Mandarin, Vietnamese, Punjabi, Spanish, Lithuanian and more. • Between 2009-2016, the Service played a major role in encouraging young people to obtain GCSEs and A-Level qualifications in a Community Language. This has not only enabled learners and schools to ensure more learners achieved the EBacc, but also played an important role in ensuring many of our young were able to compete for places at Russell Group universities. • The service has supported pass rates in excess of 92% year on year for the 100 or more students entered for exams. However, In July 2016, funding for this provision was withdrawn without any consultation with service users or staff. What are Tower Hamlets Council's proposals? • The Mayor and his administration would like to introduce a system of fees which are due to be rolled out over a period of three years. The objective at the end of the process is to see the Community Languages Service become entirely dependent on generating income from service users without any backing from a core council budget. Why do we oppose the cuts? • The work in Tower Hamlets to preserve and promote languages was underpinned by aims of raising educational attainment among those whose first language is not English as well as building community cohesion. The Community Languages Service was born out of the historic anti-racism movement and ground-breaking community cohesion work in the 1970s and 1980s. Anti-immigrant sentiments and hate crime against minority groups has increased since the EU referendum. Against this backdrop, there is a need to foster greater community cohesion by protecting and expanding the CLS which has supported established and emerging migrant communities in Tower Hamlets rather than dismantling it. • There are at least 90 different languages used in the borough (Census, 2011). Tower Hamlets is unique with regards to its high proportion of speakers of community languages. A comparison with services provided in other boroughs is inappropriate given Tower Hamlets' unique demographic. • Tower Hamlets has the highest child poverty rate in the country and the highest worklessness rate in London with many dependent on Universal Credit the welfare system. A recent University of Oxford study found that ethnic minorities still face discrimination at levels unchanged since the late 1960s and experience higher unemployment, lower wages, poorer work conditions and less security in work and life. The CLS supports young people in getting the most out of their education by providing them with an understanding of their first language and culture so that they can compete and achieve against the discrimination they are more likely to face in the job market and in the education system. • Introducing fees will lead to a decline in enrollment numbers. Over a period of the three-year roll out proposed by the Mayor, fees will need to be increased in order to ensure the costs of the service can continue to be met from a declining user base. This will eventually pave the way for the complete dismantling of the service. For many of the 47 community organisations that rely on support from the Community Languages Service, it will mean they are no longer sustainable, and they will be forced to close their doors. For the staff employed by the Council it will undoubtedly mean job losses. • There has been no meaningful consultation to date with community groups and organisations that rely on the support from the CLS. • It is clear that the Council's proposals are not an attempt to remodel the service but to dismantle it. What are we petitioning for? • We strongly oppose the move put forward as part of the budget proposals, which will see the service lose its core funding over a period of three years. • Before any change takes place, the CLS should be consulted with the 47 organisations who are working directly with users to deliver on Council objectives. • We call on the council to undertake a comprehensive review on how the CLS is being managed and develop a plan to ensure their viability through public funding to ensure the service is sustainable and can continue to thrive for years to come.